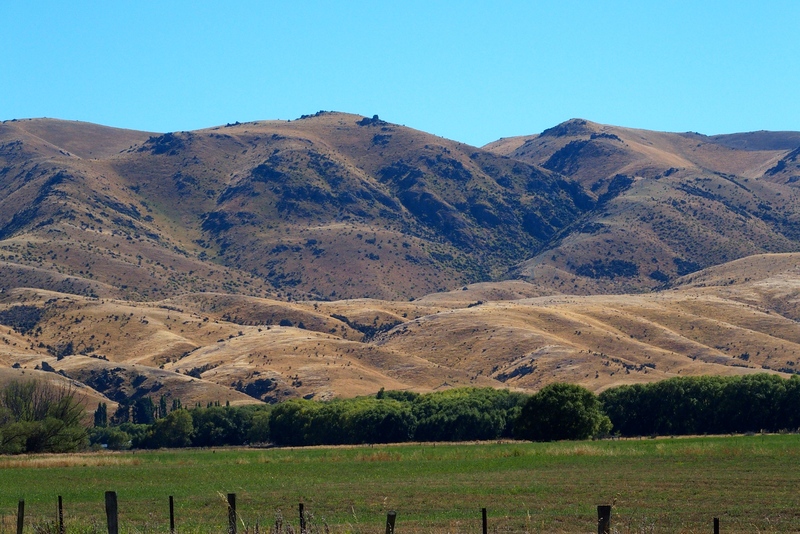 If you’re a Hobbit fan, you may have already seen all the landscapes we found on the South Island. For us, there was something new and exciting around every corner. 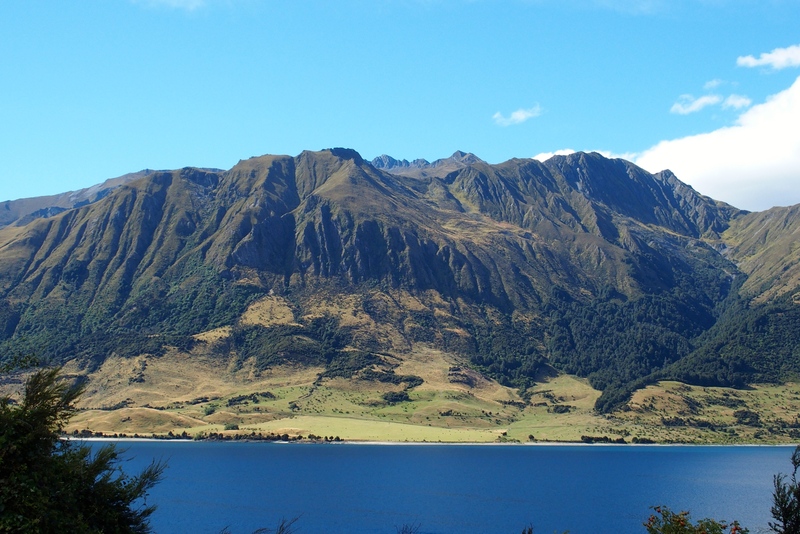 The South Island is 500 miles long and the “Southern Alps” run down the center for nearly the whole island. We started in Christchurch and traveled north along the Pacific Ocean, then west to the Tasman Sea, then south, east, north and back to Christchurch. That meant we saw the same mountains from both the east and west sides. Our first day was a sidetrip south to Akaroa, a resort area that is unique in having French and British influence, both powers having established a settlement in the area in August 1839, actually within a couple days of each other. Now streets on the north side of town are Rues and those on the south are just streets. We found a French restaurant for lunch, Ma Maison, and had our first New Zealand food, wine, and views. All quite nice. 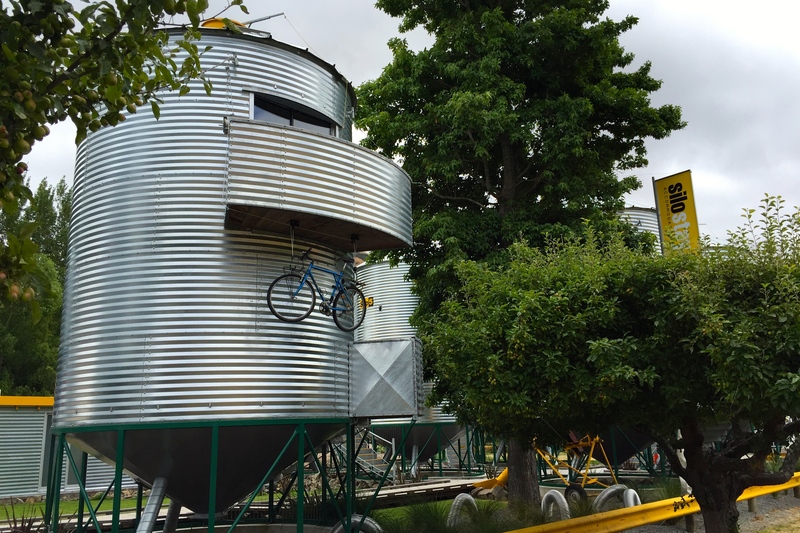 We saw this unique accommodation on the way: grain silos utilized as motel space, complete with bicycle storage. 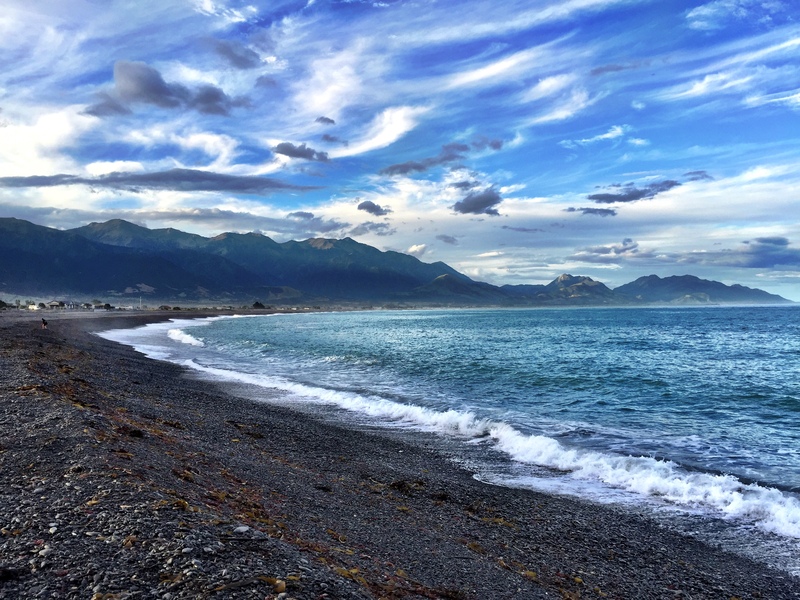 Following our path out of Christchurch to the north, our first stop was Kaikoura Bay, a popular beach town for vacationers. Our original plan was to swim with the dolphins here, but the water was still a bit chilly, probably less than 65F. The scenery, on the other hand, was spectacular. 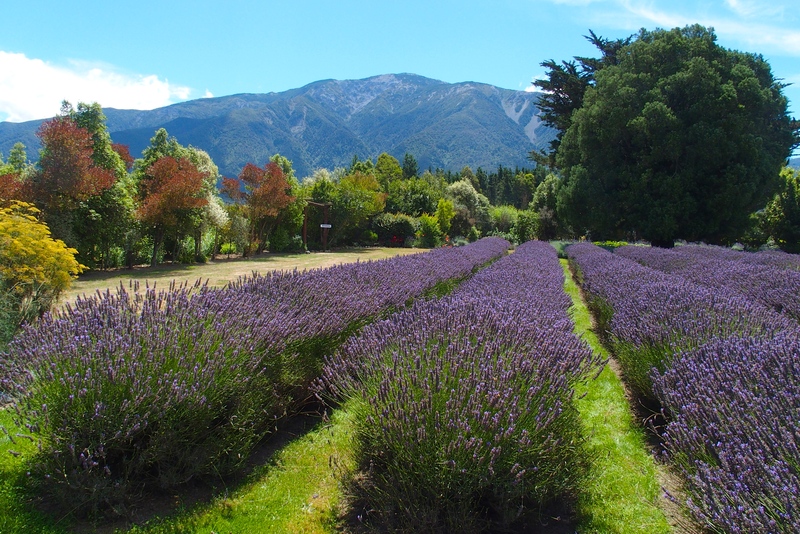 And even before we’ve reached Provence, we’ve stumbled upon lavender fields on a Kaikoura hillside. The salt looks like it falls in the Pink Himalayan category. 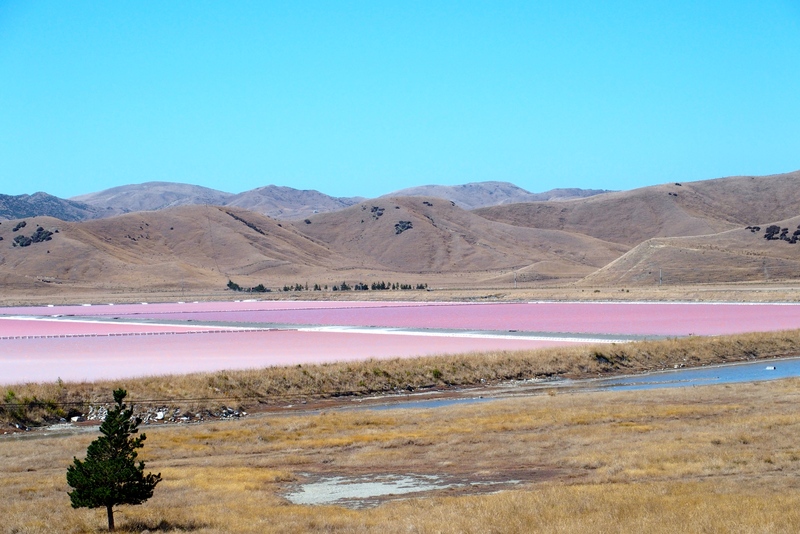 This color actually comes from microscopic green algae (that changes color) and pink shrimp. After processing, the salt is white. We reached wine country, with acres and acres of vineyards. 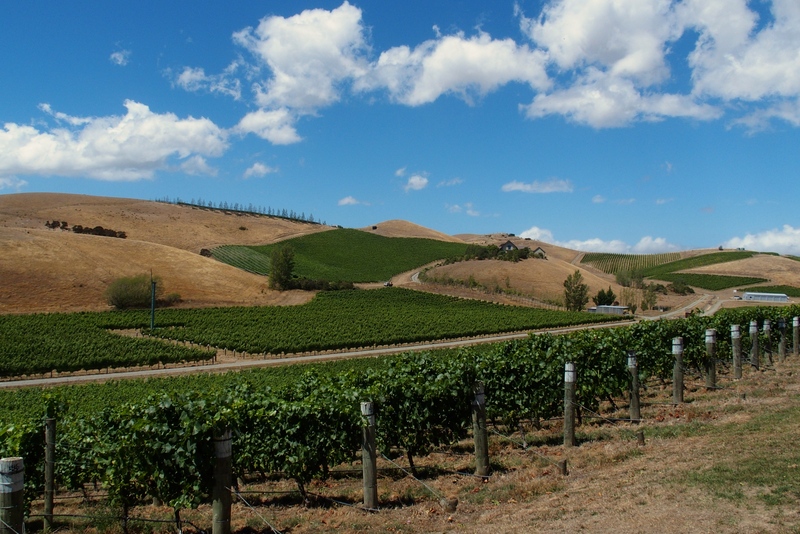 In fact, the Marlborough region produces 77% of New Zealand’s wine, and most (86%) of that is sauvignon blanc. Note the brown hills next to the lush vineyards. A bit like California. We landed at Rock Ferry for a very nice lunch, good wine, and fantastic dessert. The wines here are lovely, with sauvignon blanc a local specialty. A nice light sauvignon blanc from Rock Ferry. Note that all wines in New Zealand have shifted from cork to twist cap. 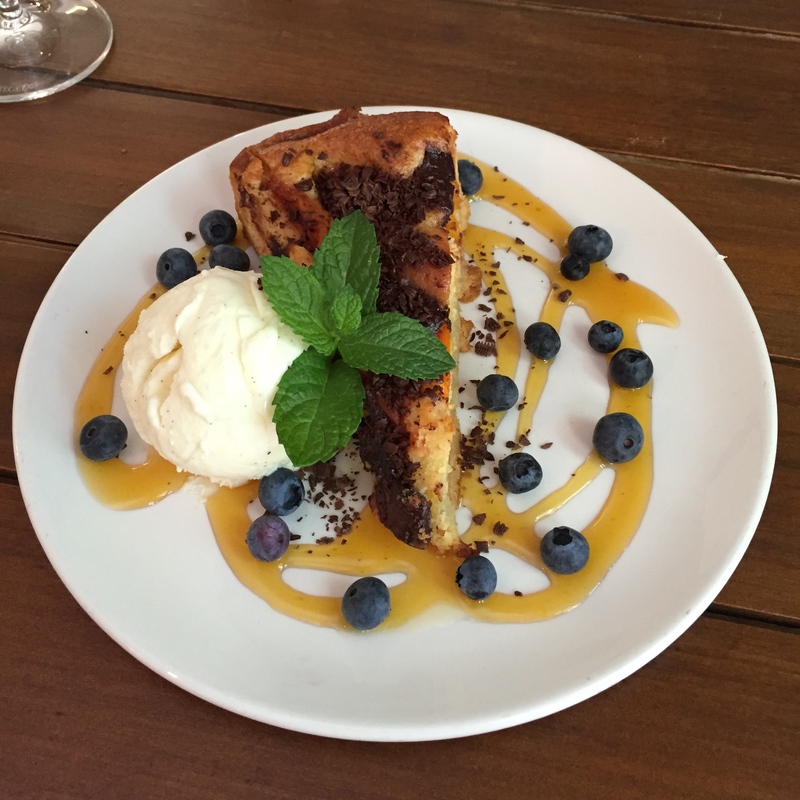 This dessert was heavenly: apricot and almond with caramel sauce and blueberries, vanilla ice cream, and fresh mint. We will have to try to recreate at Keuka this summer. 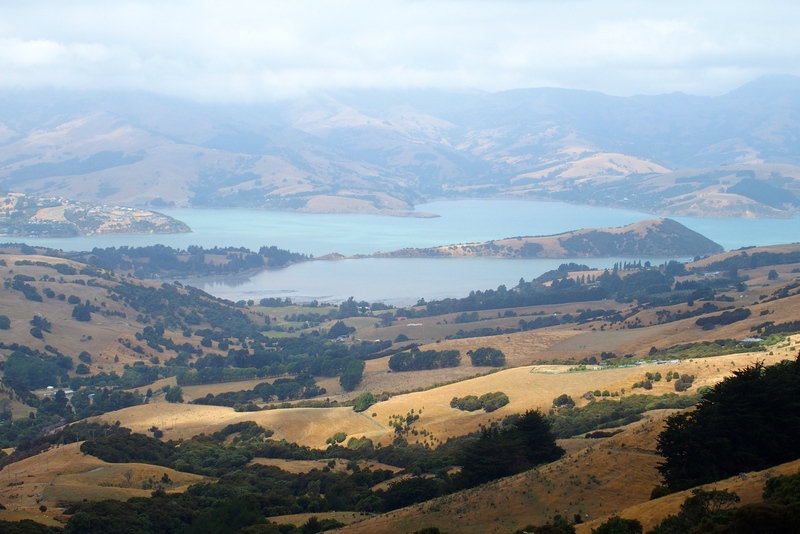 Coming back from Akaroa we looked for sheep. After all, New Zealand has 20 sheep for every person, right? We hadn’t seen many yet. Where are they all? Actually, official stats say the ratio has dropped to 7 sheep per one person in New Zealand. 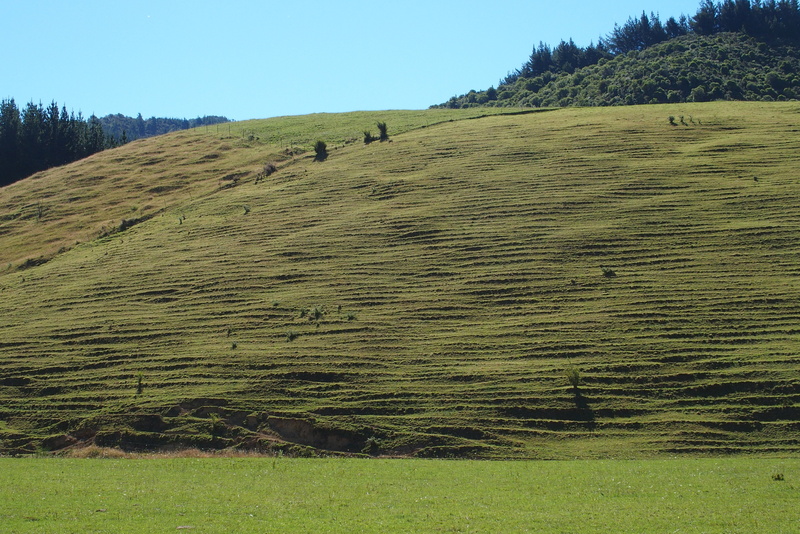 No sheep in sight, but all these little terraces are actually the hoofpaths from grazing sheep. 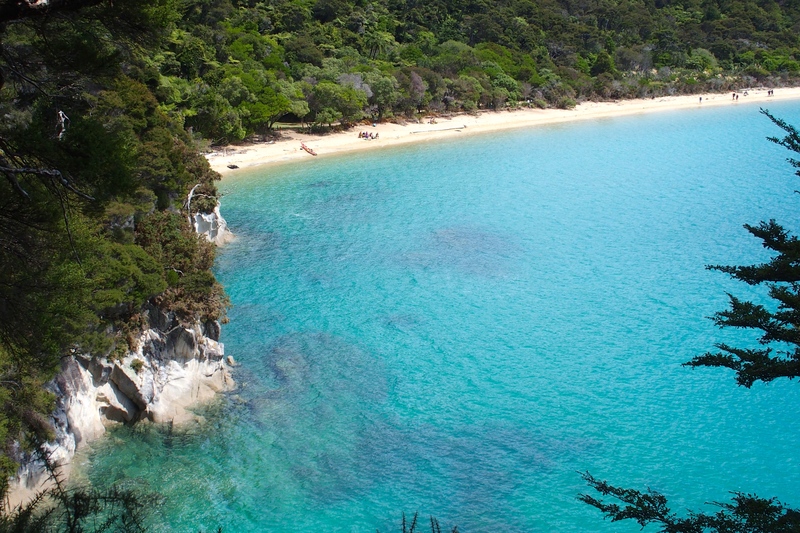 We moved northwest to Abel Tasman National Park, a great place for scenic views and hiking. Abel Tasman was a Dutch explorer who first saw New Zealand in 1642 and thought it was part of South America. His geography was a bit off. 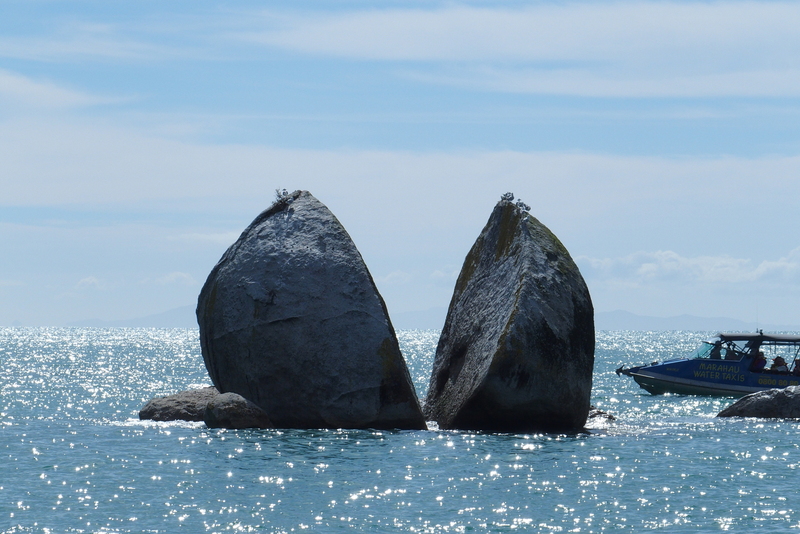 One notable spot along the ferry ride is Split Apple Rock, a giant granite boulder that has broken in half. Ferry service for the park is great. You can board a ferry at the park entrance in Kaiteriteri and do a round-trip north to the tip of the park at Totaranui in 3.5 hours. Most people get off at one of the stops along the way and do a short or long hike on the 22-mile path along the coastline. After swimming and taking photos, you hop back on the ferry at the next stop. Beaches and views in Abel Tasman are spectacular. This is near Tonga Quarry. 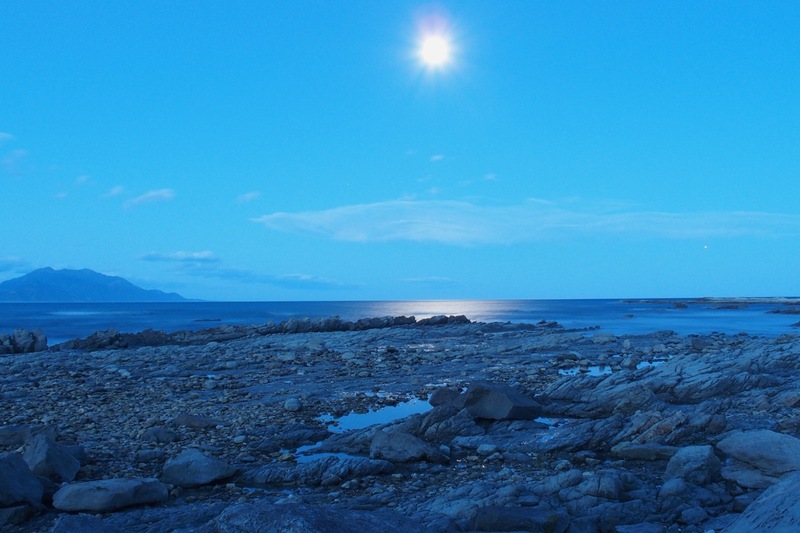 All along the west coast are views of the rugged shore. 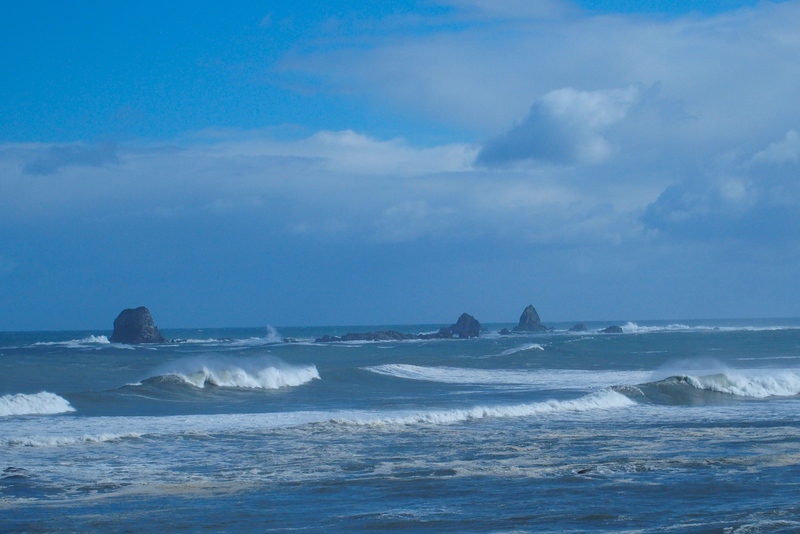 Cape Foulwind is suitably named. 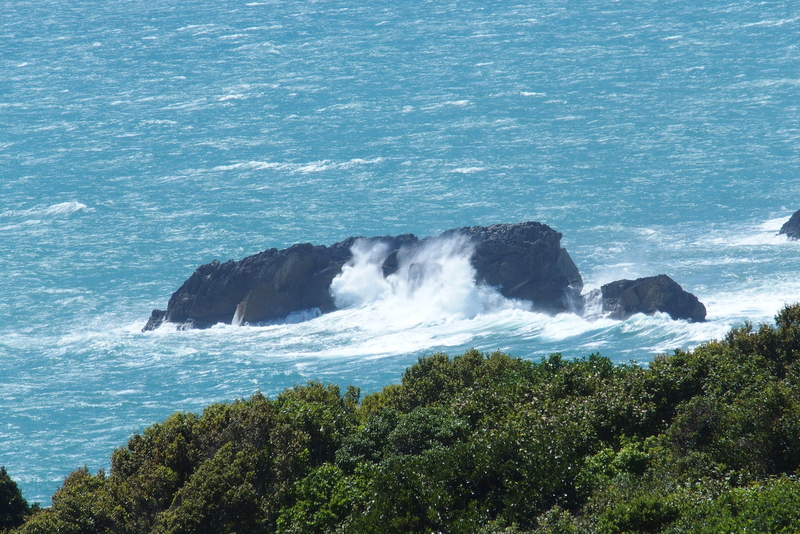 We were here on a bright sunny day, not foul at all, but still with rough seas. It’s easy to imagine the wind picking up and creating a tempest here. 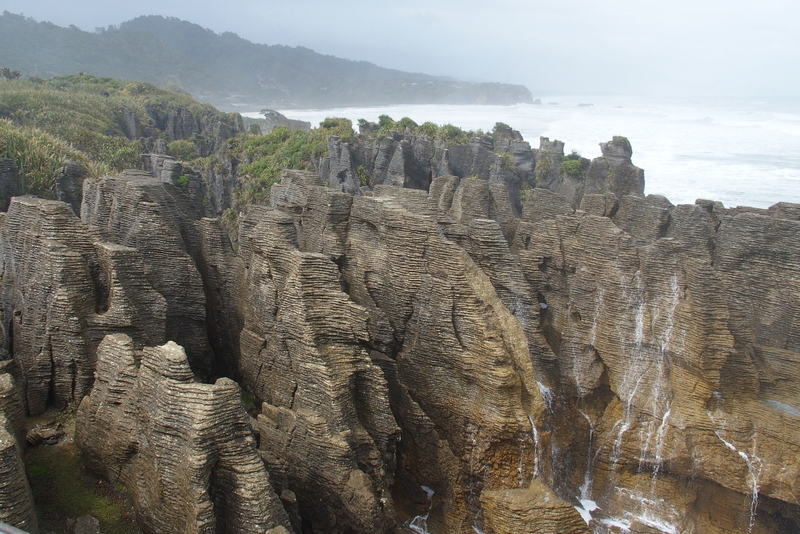 We stopped for pancakes in Paparoa National Park. 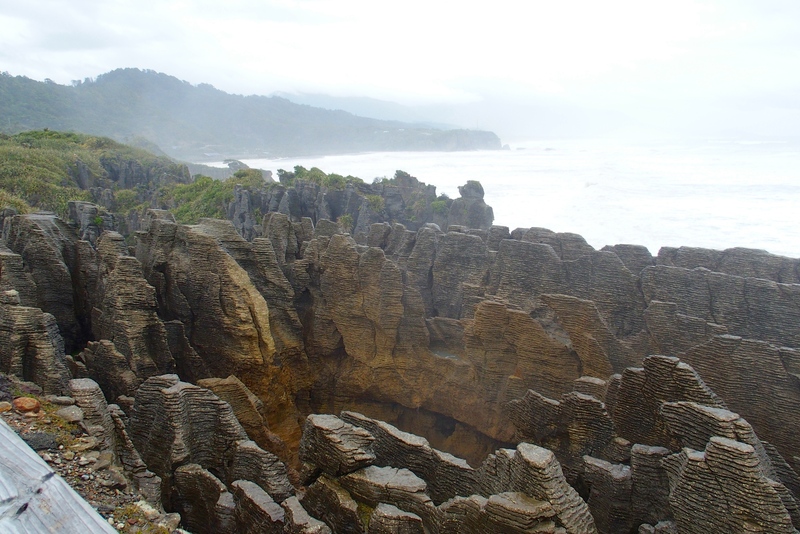 More accurately, we visited the multi-layered pancake rocks of Punakaiki. These rocks are over 30 million years old and made of layers of limestone and mud. Waves, rain, and wind have etched away the softer material to leave these layers. 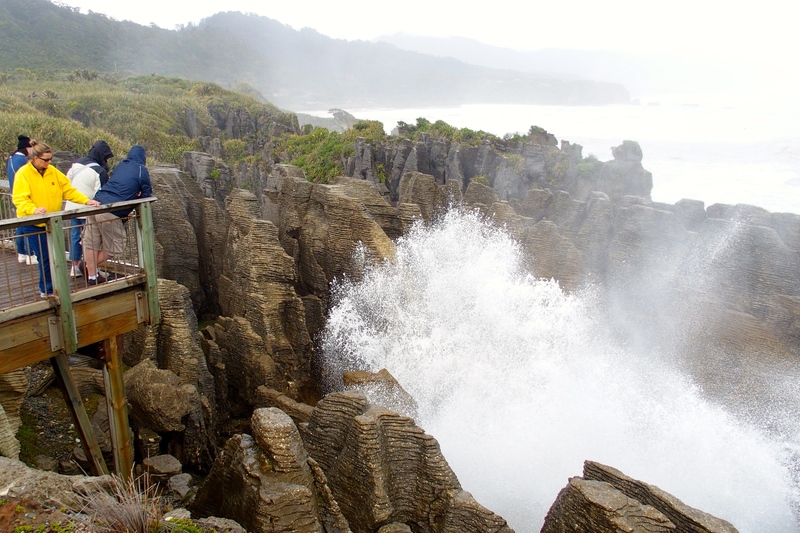 Pancake rocks, with surges of the sea providing a white foam syrup drizzling down. and now the waves have come in. Some of these sprays reached 50 feet in the air. 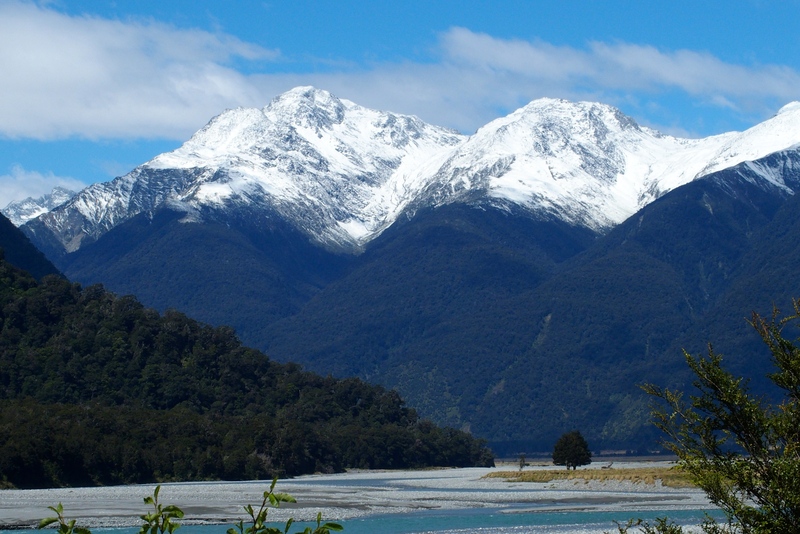 Midway down the west coast is Westland Tai Poutini National Park and Franz Josef Glacier. Just as we found in Glacier National Park in the US, the glaciers in New Zealand appear to be shrinking with global warming, this one dramatically. It was once possible to hike up to the bottom of Franz Josef (named after the emperor of Austria) and climb on the glacier. Now the glacier has receded and the lower sections are not considered safe. You can, however, take a helicopter ride to a spot higher on the glacier and walk around. Franz Josef, more romantically known in Maori as Ka Roimata o Hinehukatere (the tears of Hinehukatere). Her frozen tears are for her lover who was swept to his depth by an avalanche. 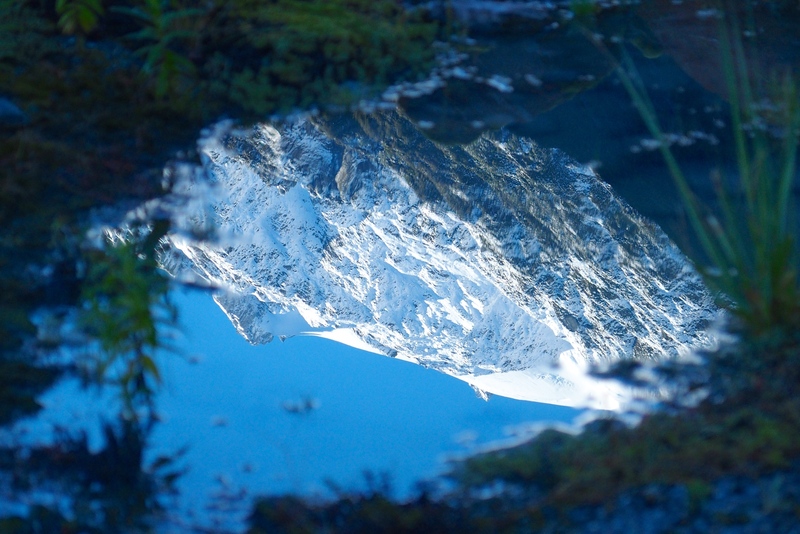 This is actually a reflection of the glacier in a small pool. 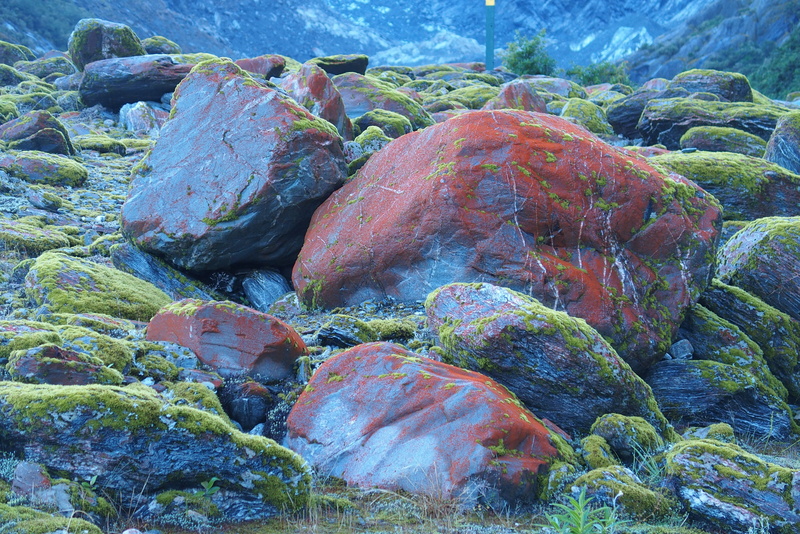 Nature created this colorful graffiti on the rocks along the trail. Slightly south, Fox Glacier, named after a long-ago New Zealand prime minister, is the prettiest glacier we’ve seen on our travels. It is fairly accessible and ends at just about 1,000 feet above sea level in a rain forest region. Pretty, but deadly. 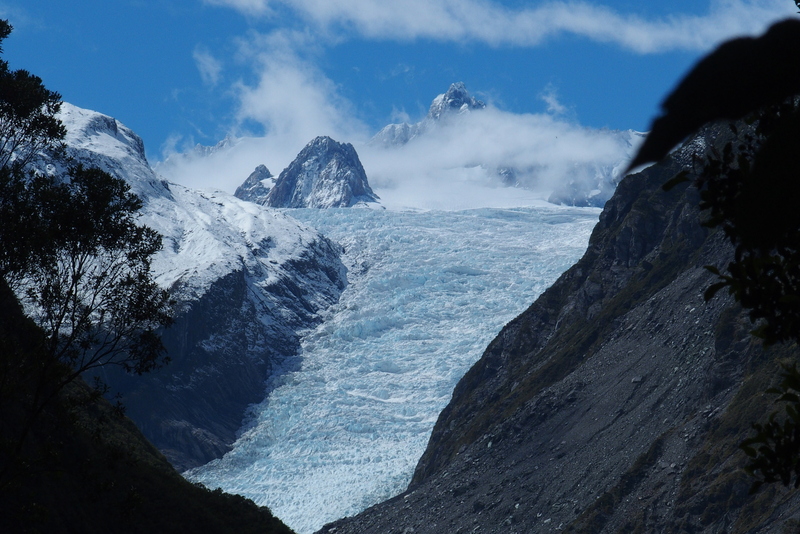 In 2009 two tourists got too close to Fox Glacier and were killed by an icefall. Mount Cook is over 12,000 feet tall, behind Fox Glacier. It appears somewhat taller because its base is just above sea level. As you look up at its peak, you see about 11,000 feet of rise. (Compare this to a fourteener near Denver. If you are in Denver, which is a mile (5,280 feet) high, and you look up to a 14,000-foot peak, it is less than 9,000 feet above you. Sir Edmond Hilary used Mount Cook to practice before he went on to conquer Everest. Looking west at Mount Cook in the clouds. 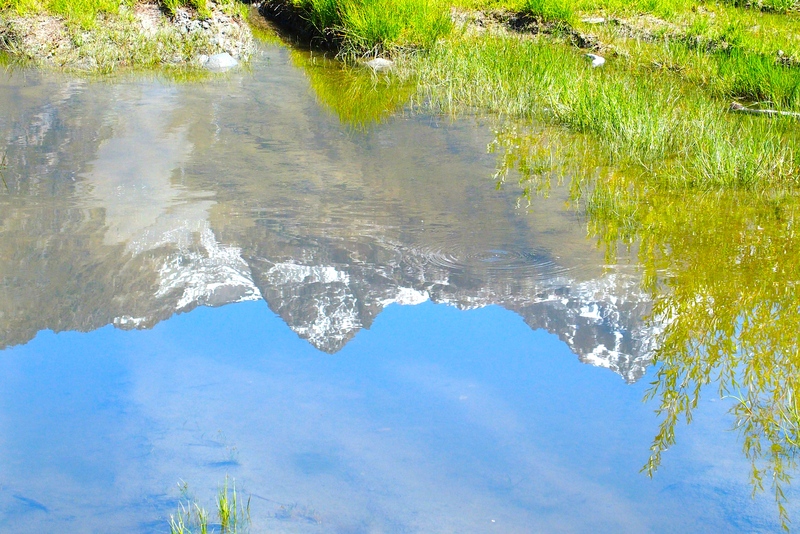 Glacier melt has formed a river. 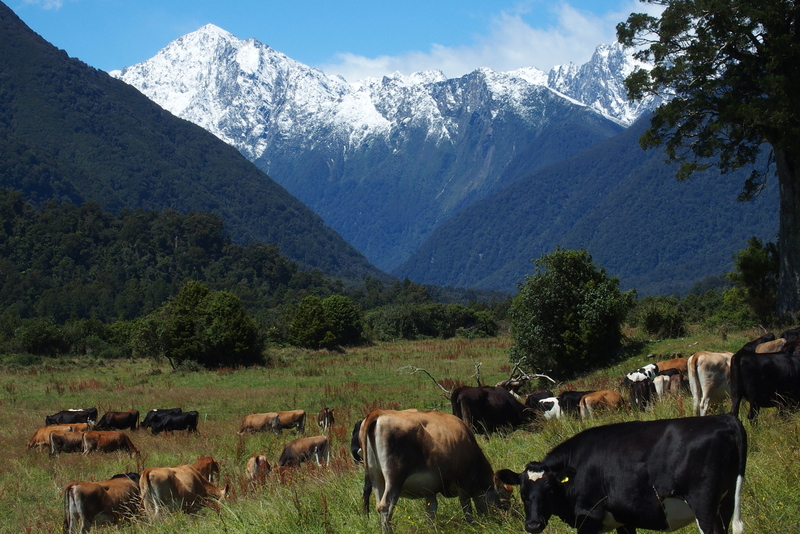 These cows don’t seem to appreciate the view. 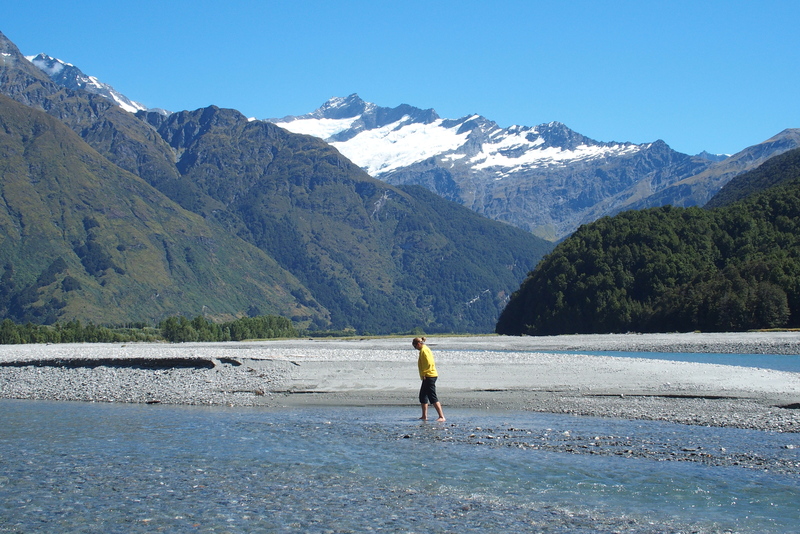 And more, the Haast River. It was just hard to stop taking photos. Meanwhile, looking west on our travels near these mountains we still had gorgeous ocean views. 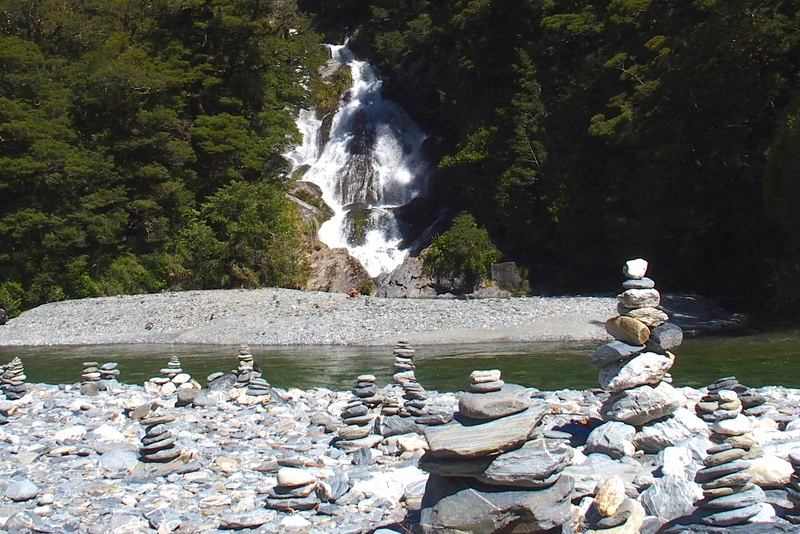 At Fantail Waterfall, visitors have made hundreds of small rock piles or cairns. 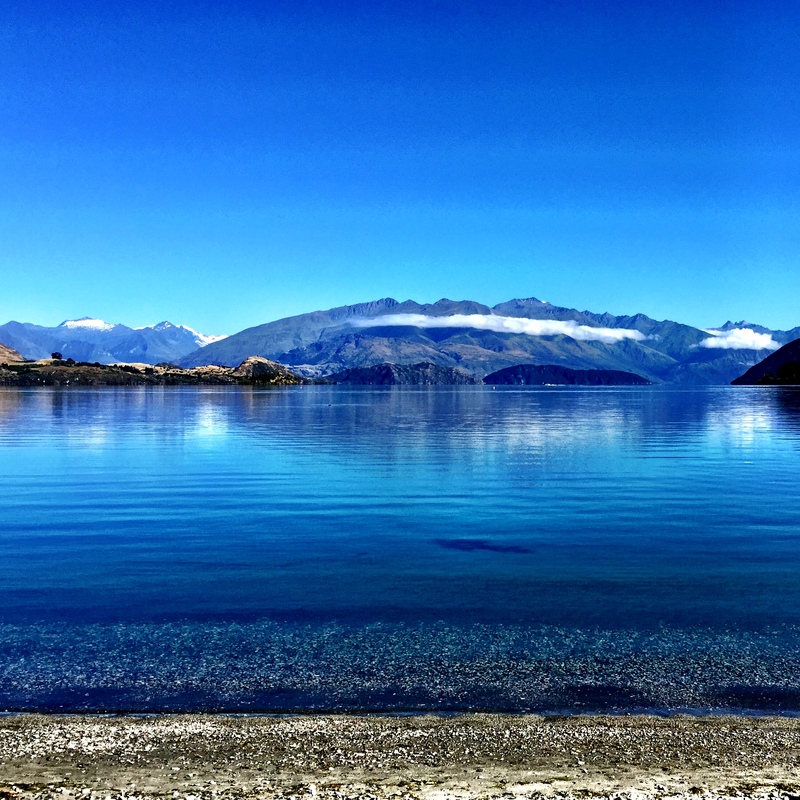 A southern view of the Alps from peaceful Lake Wanaka. 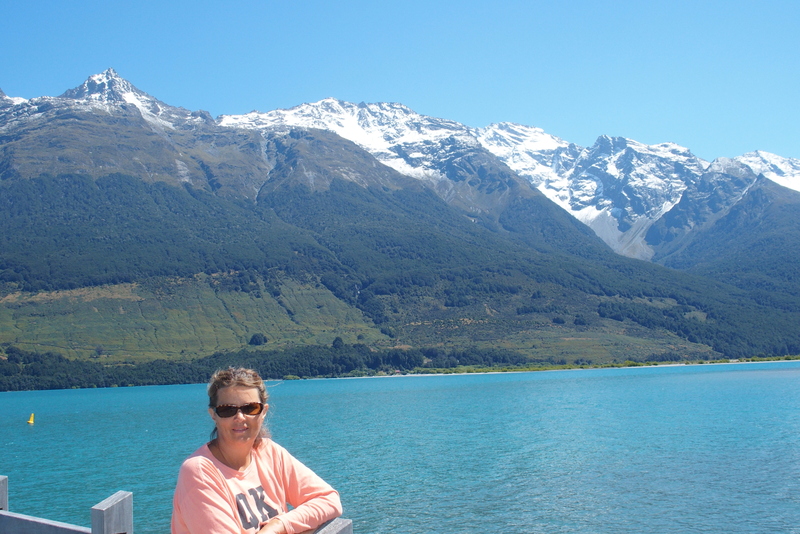 We spent several days in Queenstown on Lake Wakatipu near the Remarkables mountain range. The Remarkables behind Lake Wakatipu. Even more remarkable, we had just had some rain at sea level, putting summer snow on these peaks. One of the remarkable non-natural things we saw in Queenstown was the mass frenzy to buy a Fergburger. During the Waitangi Day holiday weekend, hundreds of people waited in line, while all these views were just outside the town. More of Lake Wakatipu on the way to the small village of Glenorchy. Heading northwest again, we returned to Wanaka Lake. 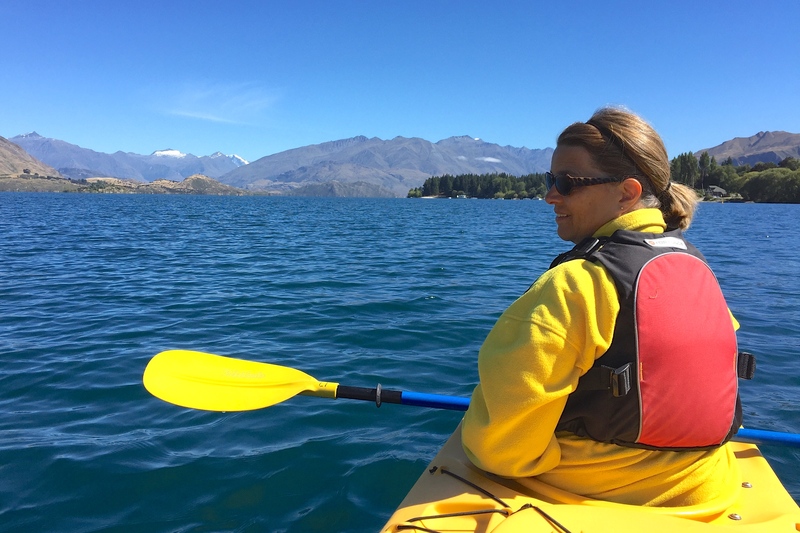 Wanaka was a great place for a kayak ride, a little more than a mile to Ruby Island (top left) for a picnic, with great views along the way. It was warmer than it looks here. Michael actually took a short (and unplanned) swim when we came back to shore. 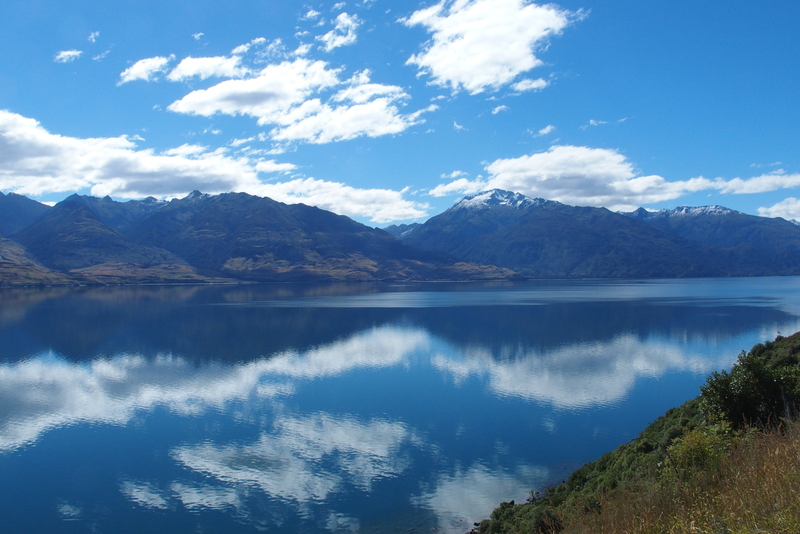 Wanaka Lake is just east of Mount Aspiring National Park. We drove into the park paralleling a river, expecting to see the mountain with every turn we made. Matukituki River, wide and shallow. 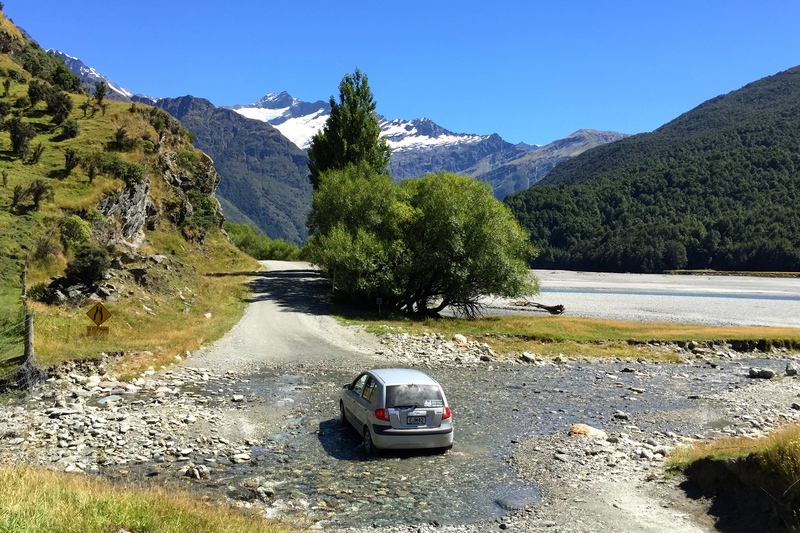 Fording the river is fairly easy at this time of year. We actually had to ford nine small streams feeding Matukituki River as we made our way into the park. No problem for our trusty little Hyundai. 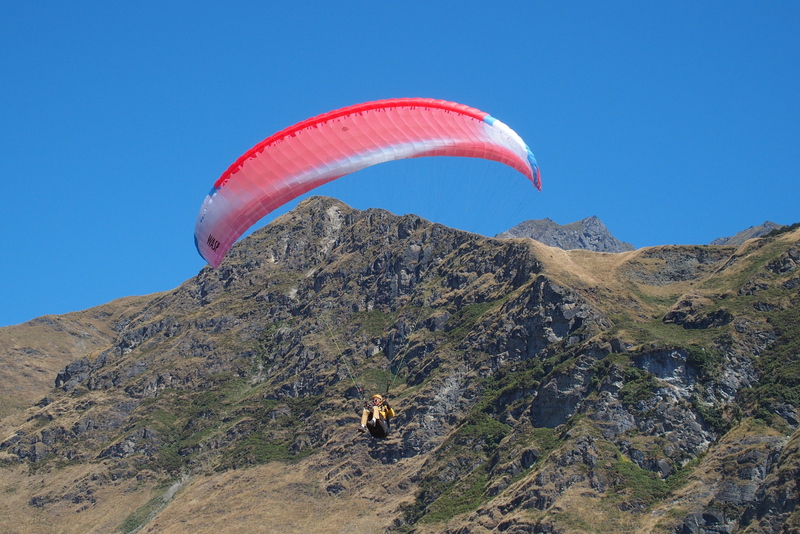 A dozen paragliders found the cliffs along the road from Mt. Aspiring quite INspiring. On the east side of the Southern Alps, we found a couple lakes with the most amazing turquoise color. Like the glacier-fed water in Banff, these had small particles suspended in the water that caused refraction to this beautiful color. 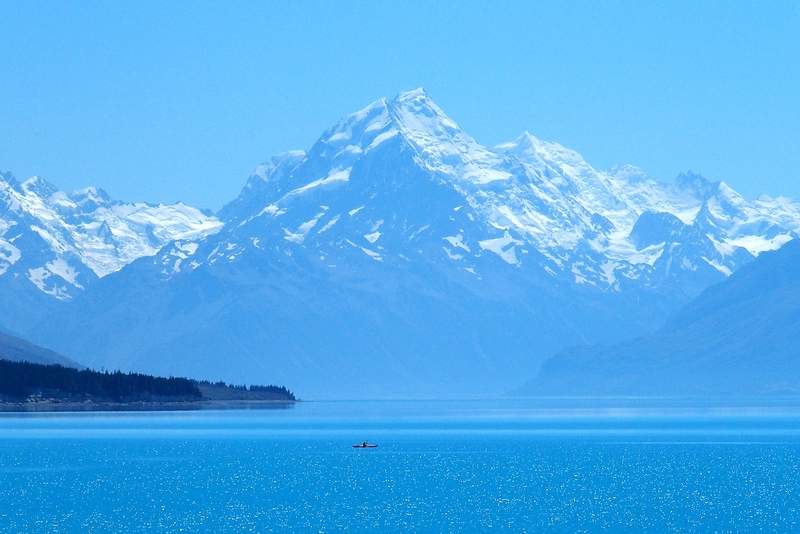 Mount Cook viewed from the east side behind glacial Lake Pukaki. Lake Tekapo is a natural lake that has been dammed to provide hydroelectric power. In fact, the two lakes, Tekapo and Pukaki, provide half the electric power for the south island. The landlady at our B&B in Tekapo (who baked the best homemade croissants!) told us that farmers and townspeople are starting to get into water rights disputes. There just isn’t enough to go around. 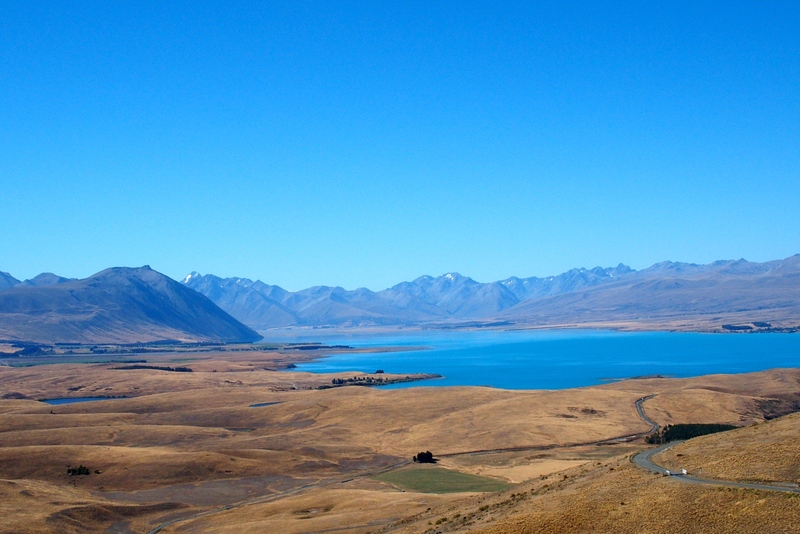 A view of Lake Tekapo from the Mt. John Observatory. Some areas reminded us of the western parts of the US. 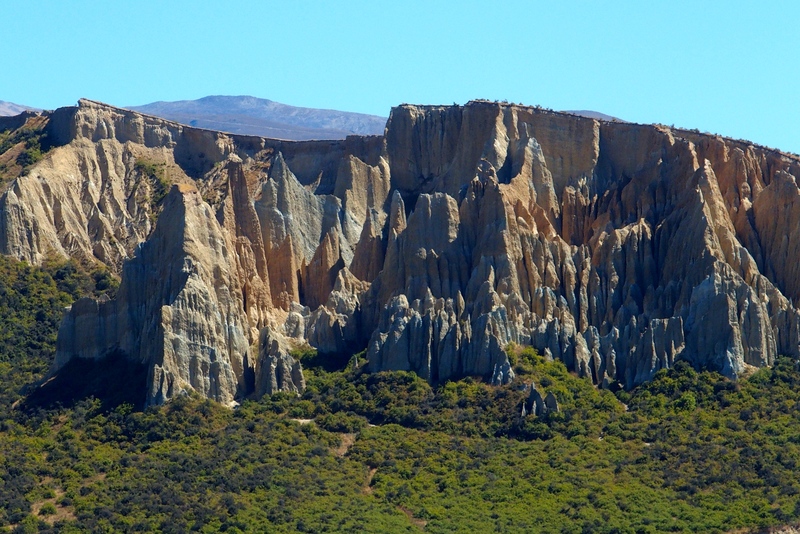 These clay rocks along the Waitaki Valley look a bit like Sedona. And these hills quite close to the ones we saw north of San Francisco. We ended our long scenic ride an hour south of Christchurch and visited Ashburton’s Botanic Gardens. 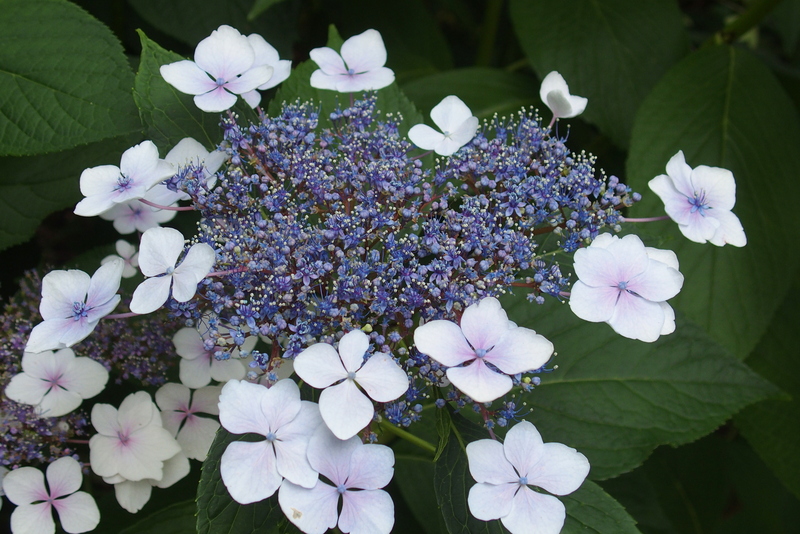 The park has more than a dozen varieties of hydrangea in all shades of bright red to blue to purple and various pastels. 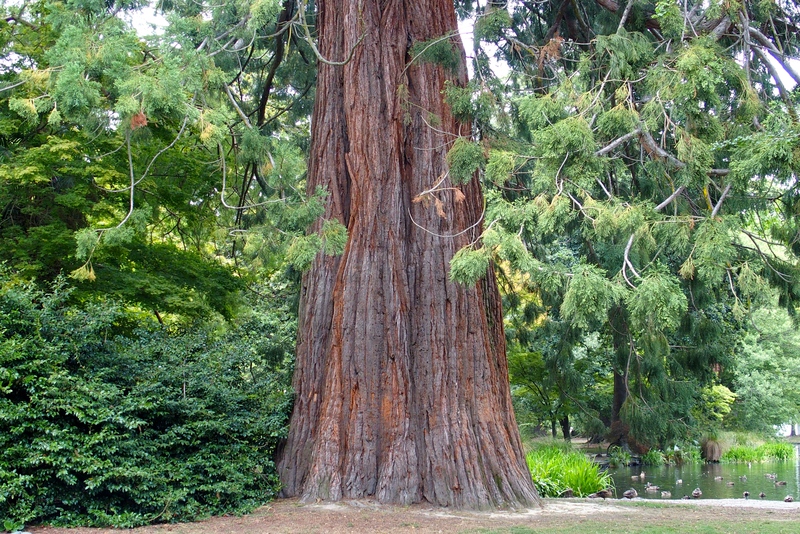 Ashburton’s Park even has a redwood tree. After three weeks and 3,200 kilometers (2,000 miles), we’re leaving New Zealand. 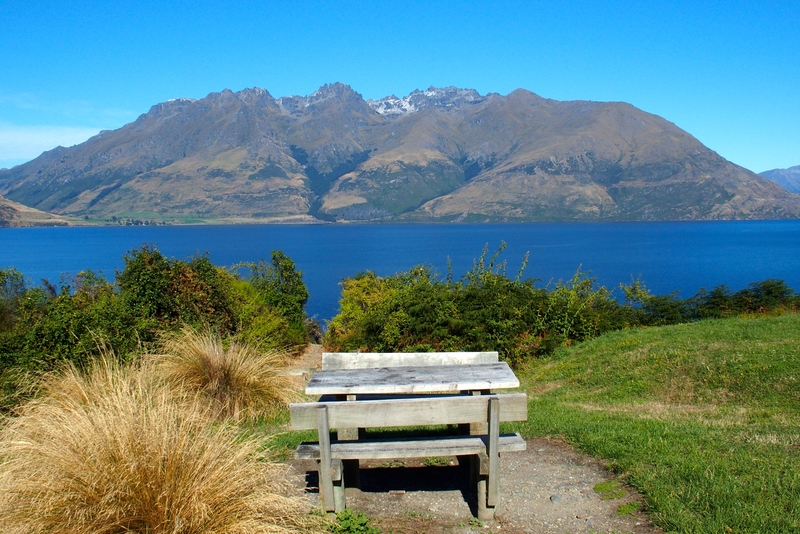 With all the beautiful scenery, it’s impossible to pick our favorite spot on South Island. 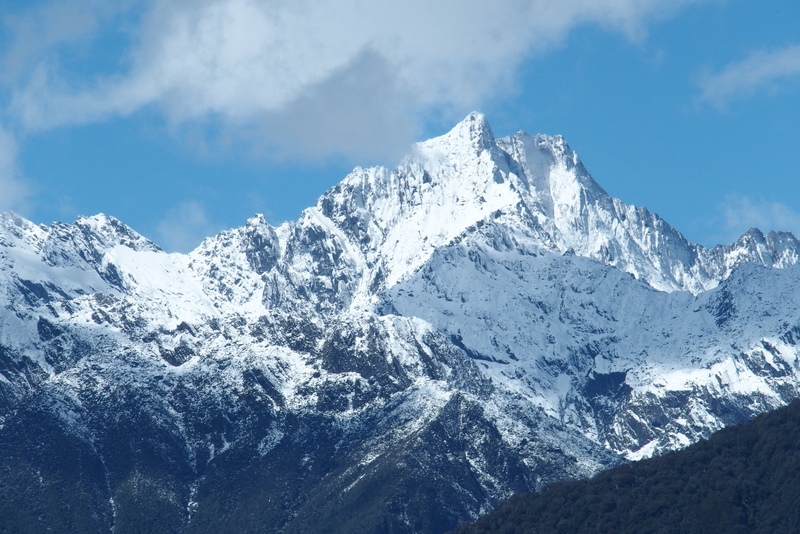 This entry was posted in Travel Journal and tagged mountains, national park, New Zealand, ocean, Southern Alps, wine. Bookmark the permalink.